Welcome to shopping from Sammid store. We make sure provide all high quality products to all customers! Simply finger touch the charging case to power on/off the earbuds. You can also touch the earbuds to answer/end/reject phone call and control music. One earbud can be connected with 2 devices at the same time. Here is the steps: Firstly press 5s to pairing mode, pair it with your first cellphone and then turn off this headset. After that press 5s to pairing mode again, pair it with your second cellphone, when pairing completed, the headset needs to be turned off. OK, pairing with two cellphones succeed. 1.Due to the technical characteristics, in dual earbuds mode, only right earbud works when dialing or answering the phone. Please adjust the volume through your mobile phone during talking. 2-channel stereo for music and video. 2.Please do not soak the earbuds, or store it in a high temperature environment. If you accidentally drop the earbuds into the water, do not turn on the earbuds immediately. Leave it in a dry place for 12-24 hours before turning it on. Happy shopping from Sammid store.Thank you very much! ❤【Full Touch Mode】 Both of the charging case and earbuds are controlled by touch. Simply double touch the charging case to power it on/off. High capacity lithium battery in the earbuds can support continuously music time for about 4-5 hours.Adopt full-touch technology, starting up the earbud only by touching, answer an incoming call / refuse an incoming call, play music / pause music, volume control. ❤【Wireless Earphone With Charging Case 】There is a 5200mAh charging box, which can be used as a portable power bank and offering power supply to the BT earphones when in urgent need. 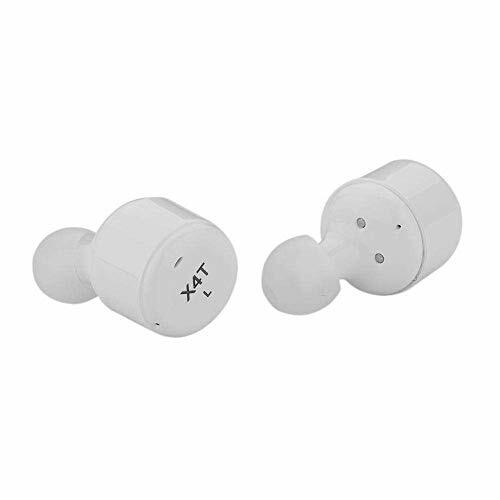 Moreover, the charging box supports wireless charging function for smartphones, such as for iphone 8/ 8 Plus/ x..Twins wireless headphones can be used simultaneously or separately, one earbud can connect with two devices at the same time. ❤【HD Stereo Sound】 - Bluetooth headset built in HD and sensitivity microphone, CVC 6.0 Noise Canceling technology helps provide clear and loud sound, professional sound chamber is also designed for perfect sound experience.Support up to 4-5 hours of continuous music for prolonged enjoyment for two earphones (up to 6-7 hours for one earphone). ❤【Comfortable Heaphone】More Caps for Different Ears,Anti-sweating silicone caps keep the headphones in your ear canal firmly and ensure a secure and comfortable in-ear experience. Extra 2 pairs of caps are included to fit for different ear size.which is perfect for gym, jogging, hiking, cycling, and so on. ❤【After Sale Service】We make sure provide all high qulity earphone to all customers.If you have any quality problems of this earphone ,feel free to send E-mail to us ,we will guve you a satisfied solve,will refund all money to you or re-send new one earphone to you.Welcome to shopping from Sammid store.